Hit Each Ball With Pin-Point Accuracy! Hitting a real baseball takes skill, but imagine the skill required to hit a ball the size of a golf ball. 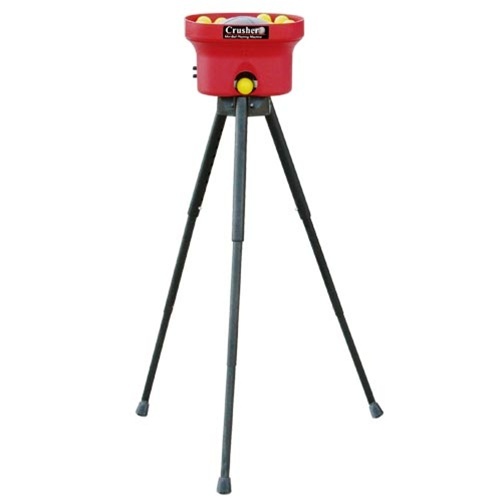 Now, with the Crusher Mini Lite-Ball Pitching Machine, you can train your eye to hit a ball approximately two-thirds smaller than a real baseball. And if you can continually hit this ball, imagine how great you'll hit a real baseball when you step up to the plate. The tubular steel, professional quality tripod stand delivers each pitch from a realistic pitch height. The Dual Speed Controls give you the ability to hit fast balls and curve balls from 15 to 45 MPH with the simple turn of the knobs. Features the Professional Pitch Location System (PPLS), the preferred technique used by hundreds of professional level hitters. The Crusher pitches the desired pitch in the same location time and time again. This allows you to train your body and mind to memorize the location, feel, and mechanics of hitting the ball in each specific location. Now with slight adjustments to your swing and bat angle, you can hit the ball at will and develop long-ball crushing power. The Crusher will use any hollow golf ball size practice or wiffle ball. However, we recommend the Heater Chucker Lite-Balls as they are specifically designed for the Crusher and are the most accurate. The Crusher Lite-Balls are made of soft foam and are perfect for indoor use. Overall I would give it 5 stars. The only reason I give 4 is that I wish I had purchased the full-sized ball machine. Is there any way I could return the machine and purchase the larger ball machine? If so I would gladly pay the difference for the larger machine.